Some visionaries speculate that extraterrestrial civilizations may be capable of using the energy extracted from their suns to power planet-sized spaceships. A professor from the University of Edinburgh says he knows how we might be able to find such objects. In 1948, astronomer Fred Zwicky, the esteemed co-discoverer of dark matter, speculated that “fusion jets” could be used by a future civilization to navigate our sun and solar system planets through the galaxy. He suggested that pellets of fuel could be fired into the sun to produce explosions that would push the sun along like firecrackers exploding in a tin can. But where to go? Zwicky thought that the entire solar system could reach Alpha Centauri in a few thousand years. Forty years later, physicist Leonid Shkadov proposed that far advanced extraterrestrial civilizations might harness the energy output of their sun for interstellar migration. They would use a “stellar engine” — no need for fusion motors here. Simply construct an immense spherical mirror that reflects some of the star’s radiation back onto its surface. This radiation pressure on the star creates an imbalance where a net force pushes the star in the opposite direction. This is simply Newtonian physics, though Sir Isaac would have never imagined such an application. To work, such a stellar engine would have to be a megastructure, millions of miles across (shown above). The bad news is that a planet might have to be dismantled to make such a monstrosity. The good news is that such megastructures — if they exist — should be detectable with today’s telescope technology. Duncan Forgan, of the University of Edinburgh, proposes that such a mega-mirror might obstruct part of the disk of a star during our observations that look for planets passing across the face of a star, an event call a transit. He modeled hypothetical light curves produced by exoplanets transiting a star that possesses a Shkadov thruster. Depending on its position, the gigantic mirror would abruptly block off the planet’s shadow prematurely (shown below), because it is occulting a portion of the star. The silhouette of the immense mirror would mysteriously truncate the predicted symmetrical U-shaped dip in starlight that is measure with each transit as a planet follows along its racetrack orbit. It would be difficult to explain the oddball light curve that would be cause by such a intervening structure. Forgan cautions that the presence of starspots can produce “dents” in the transit light curve, as the planet crosses a starspot and this could be misinterpreted as an artificial structure. However the starspot would rotate out of view on subsequent transits. Assuming the monster-mirror is fixed in space, it’s silhouette should remain stable. NASA’s Kepler space observatory has spent the last five years amassing a huge vault of planetary transit data on 150,000 stars in the constellation Cygnus. And so this hypothesis is testable. The problem is there are many unknowns heaped upon many other unknowns. What is the probability an alien civilization has the wherewithal and audacity to try building such a monstrosity, and that it is close enough to detect? After much speculation Forgan cautiously estimates a lower limit of one star in one million stars having such a detectable megastructure. This would put the nearest such star thruster 1,000 light-years away at best. The Kepler database is several orders of magnitude smaller in surveyed stars. With such low chances of success it would be hard to convince anyone to fund a space observatory to go looking for alien engineering. So it will all be left as a serendipitous SETT (Search for Extraterrestrial Technology) opportunity as exoplanet surveys continue. 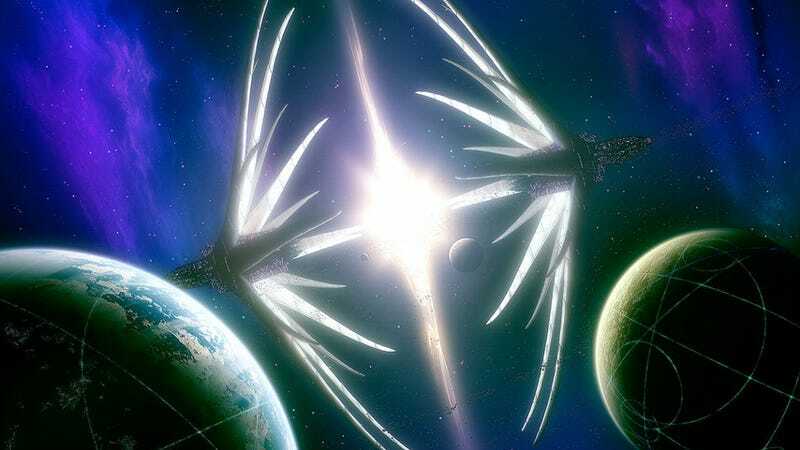 Why would a far advanced civilization go to the budget-busting expense of doing a megastructure project to steer its star around? It’s estimated that the sun has passed through 10 cold molecular hydrogen clouds laced with dust, along its galactic orbit. The consequences are that this would dim a star, and that it turn could cause some serious climate change on a planet. Long-lived aliens may want to steer around these galactic potholes. There is an extraordinarily small but finite chance that evidence for such mega-engineering is buried in archival astronomy data. What’s more, the absence of such evidence might suggest there is an upper limit to how far a technological civilization can progress. Or, more sobering, it means there are narrow limits on the longevity of a technological society.